Judge Executive Todd Ruckel has announced that Lewis County has been awarded a grant to develop a broadband plan for the county. 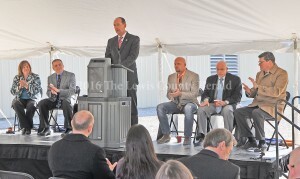 Rep. Rocky Adkins speaks during the groundbreaking ceremony at Superior Composites. Left to right, Amy Kennedy, Todd Ruckel, Rocky Adkins, Matt Ginn, Kenn Moritz and John Tippins.